Olga Jordão has extensive experience in servicing institutional investors in the financial services sector. She is currently Head of Product at State Street Banque. A Portuguese national, Olga was raised and spent most of her life in Luxembourg where she started her career at Gemina Europe Bank. She joined State Street Bank Luxembourg in 1993 and held several operational and management roles in the Custody and Shareholder Administration departments. 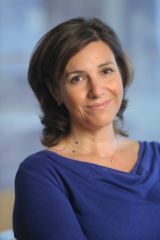 Prior to relocating to Paris with her family in 2005, Olga was a Project Manager in charge of on-boarding international Transfer Agency clients, implementing new technology to enhance straight-trough-processing and developing cross-border operating models following acquisitions made by State Street. Olga serves on the board of the PWN Global Federation, a network of over 3,500 professionals focused on leveraging 100% of the world’s talent and collaboratively advancing women in leadership. Olga holds a Bachelor’s degree in Applied Foreign Languages (English & German) from the University of Paris IV-Sorbonne and a Masters of Business Administration from TRIUM (HEC, New York University, London School of Economics).